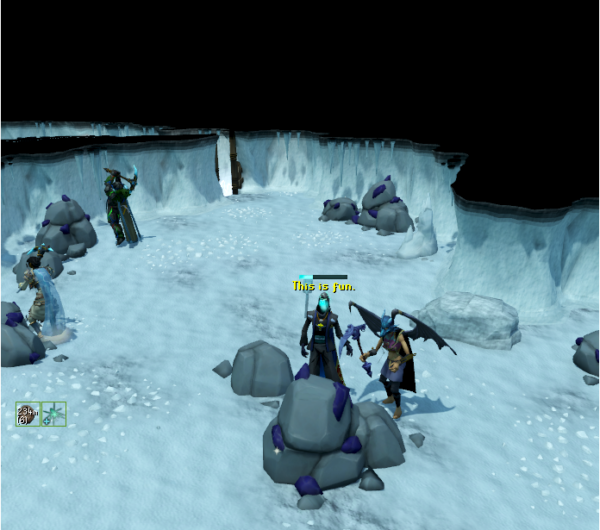 So let’s forget that a minute and return to the sheer AWESOMENESS that is the Mining and Smithing update. … and how much of a drag Mining and Smithing really is. So, in retrospect, when it all comes down to it, not much has changed. Believe it or not, because rocks don’t deplete anymore, ores are now exceptionally faster to obtain. Iron, coal, and luminite all can be mined every second with a high enough level, and even the higher-tier mining has become a lot faster because you no longer have to find available rocks or for the ores to respawn. Not only is it faster, but it’s much more convenient! Oh, did I forget to mention you can make an ore box that, after completing an achievement, will store 140 ores of each kind? And ores of one kind don’t count towards another, meaning you can mine 140 of every single type of rock in the Dwarven Mines without having to leave and still leave with a near-empty inventory! Couple that with the Grace of the Elves necklace offering 500 porter charges, and you can mine pretty much nonstop for hours at a time before setting foot in a bank. Oh yeah, bank! You don’t even need a bank anymore for your ores! Interact with any anvil or furnace anywhere and you get access to your “metal bank”, which stores ALL your raw materials (except gems, but those are for crafting) and bars. Isn’t that great! Mining’s actually become a properly worthwhile skill now! Now, with this new update, smithing a single plate-mail involves minutes of hammering and re-heating the item, and the process is repeated with even more bars and more minutes of work to upgrade it to its full potential. It’s definitely AFKable, and there are items and even prayers to help speed you along, but it’s still a grueling process. I’m not joking; this takes days to do. Days to create a single piece of armor. And the best part? It’s degradable and the only way to repair it is to infuse it with MORE masterwork armor (minus the trim, fortunately)! OK, OK, hear me out. Originally, how you got the higher tier armor is by fighting stuff. Fighting tough bosses or slayer monsters and hoping; just hoping, that one day you’ll get the drop and make it. Or, you save up a lot of money and buy it; perhaps mostly by fighting stuff. Rather than being based on luck, you make the armor yourself by gathering materials and putting in a lot of hard work. It’s different than fighting because it is both risk-free, and you are building up towards a set goal. There’s no luck involved. You are guaranteed a reward after putting in a lot of time into it. And that’s what makes the armor worth it. When you work hard for something, you come to appreciate it more because just having it helps remind you of your efforts. This effect only happens if it really is hard work, and aside from some crazy skill-based mini-game, making something take a difficult amount of time is the next-best thing. 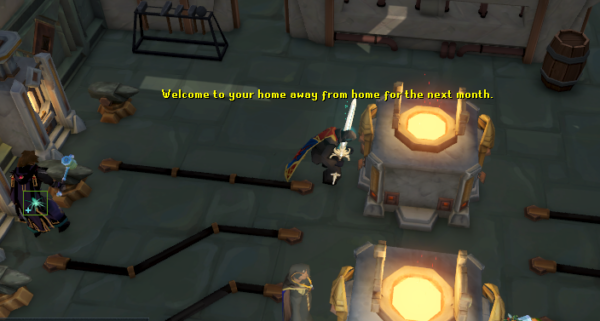 At least, like Mining, Smithing is easily AFKable. Which is interesting. I found Runescape has nowadays been promoting itself as more of a multi-tasking game where you can do multiple different things at once. They didn’t use to do that. But I like this new approach. No, it’s not just because I’m never lucky. I just like it because it’s a new option. Having a new way of doing things for the best stuff in-game aside from the mass-killing. Changes up the game dynamic a bit. Keeps Runescape interesting and fun to play. And it only took a year of development to do. They’re getting better at this.